the butter in the background is misleading, no butter in the recipe! 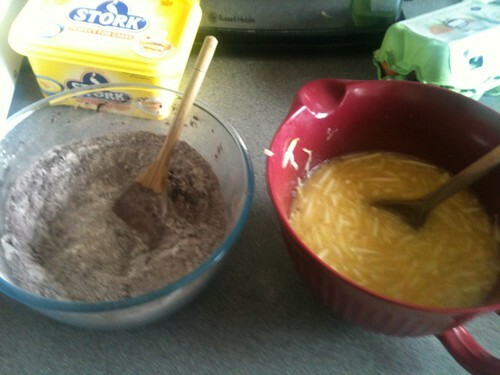 I then added the dry ingredients to the wet ingredients until they had just combined. The recipe warned not to over-mix, although this would of been difficult as the mixture was really thick and heavy so a bit tough on the old arms. Once the mixture had combined, I then folded in the toasted/chopped hazlenuts. 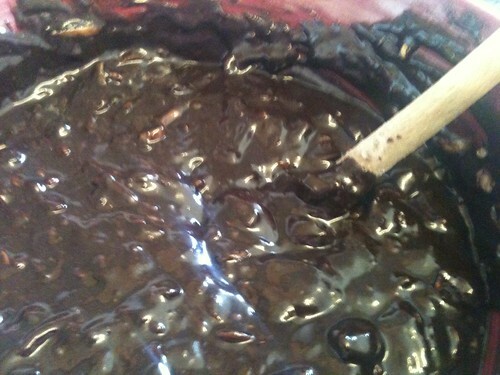 The gloopy mixture was then popped into a springform cake tin and baked for 45-50 mins. 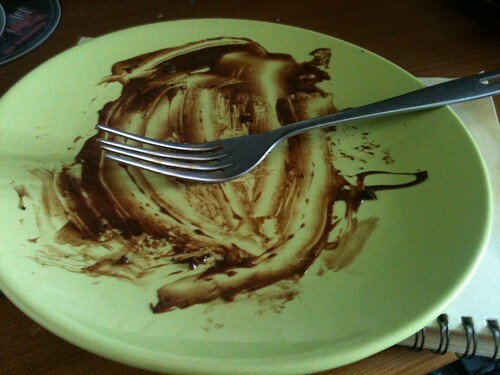 (Mine came out at 48 minutes). 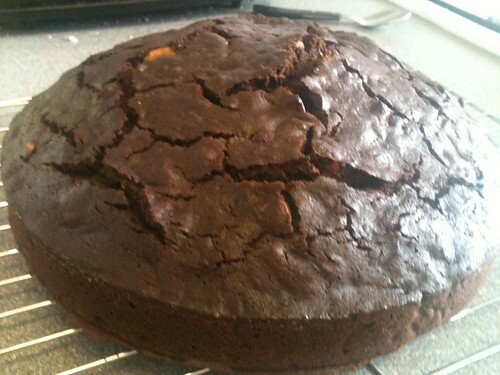 As you can see the tip cracked slightly (i.e alot), however, the inside of the cake was deliciously moist and chocolatey. For the chocolate topping I simply brought 100ml of double cream to the boil, and then poured it over 200g of dark chocolate, stirred until fully melted and yummy. Once this has cooled slightly and thickened I simple drizzled it over the whole cake, and let it dribble down the sides. Unfortunately the boyfriend decided he doesn't like hazelnuts (which I didn't know!) so yet another cake which I will be forced to eat all myself! What a shame. 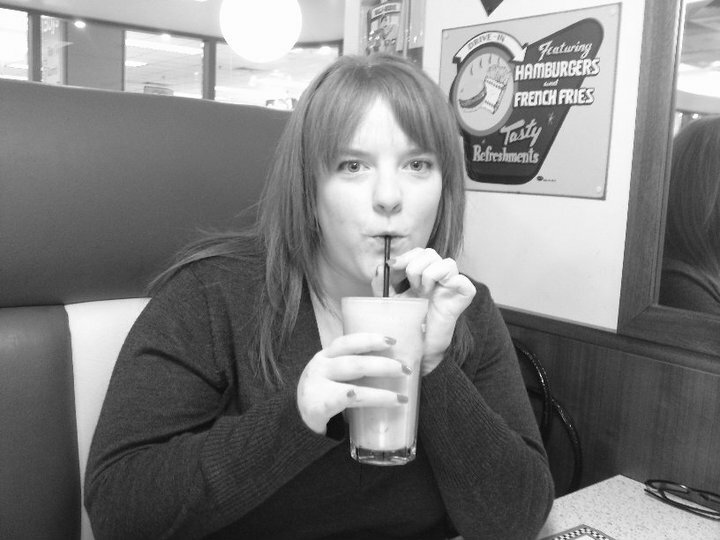 Jen- Well there is plenty left! Pop in after work for a slice! Saw your post on baking mad, look forward to hearing from you there and here. I'm a new baker too maybe we can help each toher through the medium of our blogs! You heard me right! 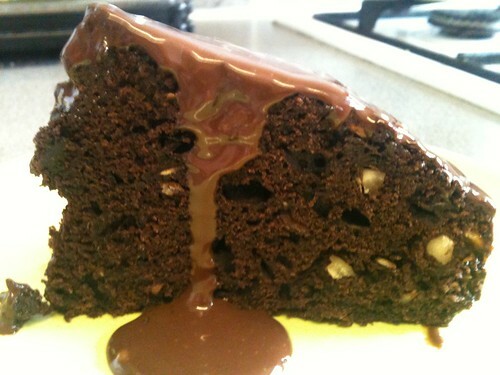 Made for a very yummy cake, I do hate using the word "moist" but that's what it was! and totally couldn't taste the courgette! 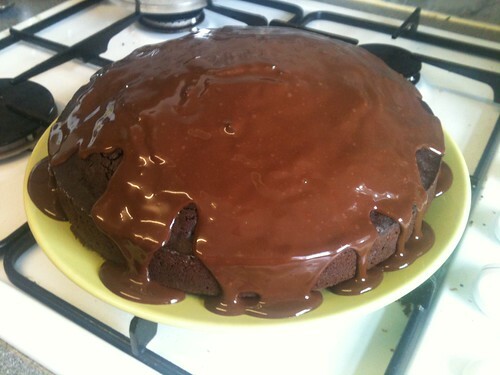 And another chocolate courgette recipe for me to try! I've already made a few and I have quite a line up for next year (have pretty much run out of courgettes for this year). Sounds good with the added hazelnuts. Hmmm. I've made zucchini bread, but making a cake with it never would have occured to me. Very interesting. 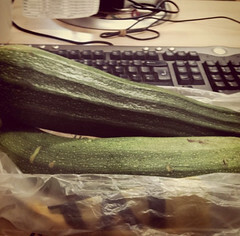 Don't worry about it, took me a long time to realise that Zucchini and Courgette were the same thing... Same with Eggplant and Aubergine! looks delicious and a fab way of eating 1 of your 5 a day!